Located in Wenfeng District, this luxury hotel is 0.5 mi (0.9 km) from Anyang Municipal Museum and 2 mi (3.2 km) from Chinese Character Museum. Wenfeng Pagoda and Yin Dynasty Ruins are also within 9 mi (15 km). Located in Wenfeng District, this hotel is 0.6 mi (1 km) from Wenfeng Pagoda and within 3 mi (5 km) of Yin Dynasty Ruins and Yinxu. Chinese Character Museum is 2.7 mi (4.4 km) away. Located in Wenfeng District, this hotel is 0.9 mi (1.4 km) from Wenfeng Pagoda and within 3 mi (5 km) of Chinese Character Museum and Yin Dynasty Ruins. Yinxu and Anyang Municipal Museum are also within 3 mi (5 km). How Much is a Hotel Room in Hebi? Hotels in Hebi start at $19 per night. Prices and availability subject to change. Additional terms may apply. Visitors to Henan will discover there is just 1 accommodation option within an easy driving distance of Hebi's downtown area, so try booking somewhere to put your feet up as soon as you can. 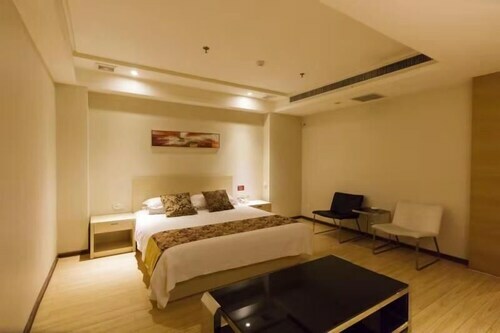 When you and your family are planning to stay less than 3 miles (5 kilometers) from the center of Hebi, the Hebi Guangye Business Hotel is a great Travelocity-listed hotel. 16 miles (26 kilometers) from downtown Hebi is the Kairui Business Hotel. The Guo Bin Hotel is a mere 15 miles (25 kilometers) away. Do you want to travel a little out of the center? Henan has many exciting attractions. Discover Henan's archeological sites, temples and monasteries and you can also fall in love with its rural landscapes, rivers and mountains. Popular things to do in this corner of China include cycling, rafting and boating. If you are curious about sport and enjoy attending local clashes you might decide to stop by Xinxiang Sports Center, which is found 35 miles (60 kilometers) to the southwest of Hebi. Modern visitors that would like the convenience of booking a room nearby, book a room in the Xinxiang Hotel or Xinxiang Bowei Style Hotel Peace Road. Situated 85 miles (139 kilometers) away from the center of Hebi is Xinzheng Airport. 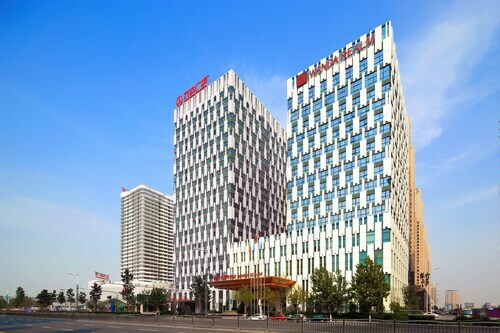 Find nearby rooms at Zhengzhou Kaifu International Hotel or Xidu Hotel.